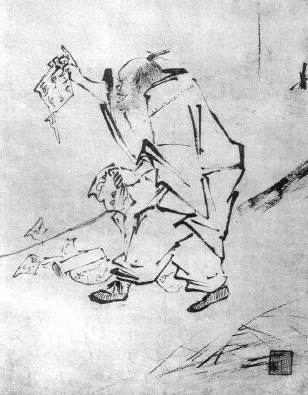 IN sixth-century China, the Buddhist schools were quite scholastic and focused on the scriptures. To move away from this academic direction and toward the Buddha’s original teaching of practicing meditation and realizing awakening in this very life, the Zen school developed its koan practice, in which stories of monks’ awakenings became a starting point for meditative inquiry. By asking and focusing on a single question as a meditative method, Zen practitioners aimed to develop a rich experiential wisdom. The whole story is considered the koan, and the question itself, “What is this?” is the central point—hwadu in Korean, or huatou in Chinese. The practice is very simple. Whether you are walking, standing, sitting, or lying down, you ask repeatedly, What is this? What is this? You have to be careful not to slip into intellectual inquiry, for you are not looking for an intellectual answer. You are turning the light of inquiry back onto yourself and your whole experience in this moment. You are not asking: What is this thought, sound, sensation, or external object? If you need to put it in a meaningful context, you are asking, What is it that is hearing, feeling, thinking? You are not asking, What is the taste of the tea or the tea itself? You are asking, What is it that tastes the tea? What is it before you even taste the tea? My own teacher, Master Kusan (1909–1983), used to try to help us by pointing out that the answer to the question was not an object, because you could not describe it as long or short, this or that color. It was not empty space either, because empty space cannot speak. It was not the Buddha, because you have not yet awakened to your Buddha-nature. It was not the master of the body, the source of consciousness, or any other designation, because those are mere words and not the actual experience of it. So you are left with questioning. You ask, What is this? because you do not know. We are not speculating with our mind. We are trying to become one with the question. The most important part of the question is not the meaning of the words themselves but the question mark. We are asking unconditionally, What is this? without looking for an answer, without expecting an answer. We are questioning for questioning’s own sake. This is a practice of questioning, not of answering. We are trying to develop a sensation of openness, of wonderment. As we throw out the question What is this? we are opening ourselves to the moment. There is no place we can rest. We are letting go of our need for knowledge and security, and our body and mind themselves become a question. You are giving yourself over entirely to the question. It’s like diving into a pool: the whole body is engaged in the act, and the whole body and mind are refreshed. You are trying to develop a sensation of questioning and an inquiry that brings about the sense of bewilderment you feel when you have lost something. You are going somewhere, you put your hand in your pocket to grab your car keys. They are not there. You check this corner and that corner of the pocket again and again, and there is nothing. For a moment before you try to remember where you’ve left them, you are totally perplexed; you have no idea what might have happened. This is very similar to the sensation you are trying to develop in Zen questioning. Concentration and inquiry are brought together with this technique. Concentration is developed as you come back again and again to the words of the question, back to the present moment. The question is the anchor of your meditation, the fixed point. By cultivating concentration, you allow for a certain calmness and spaciousness to develop. The process of inquiry is vivid, because you are not repeating the words like a mantra—the words themselves are not sacred, nor do they have a special resonance. They are just the diving board from which you dive into the pool of questioning. By repeatedly questioning with the energy and interest of someone who has just discovered she has lost something, you evoke a brightness in your whole being. This questioning gives you energy, because there is no place to rest, and it allows for more possibilities and less certainty. It is a kind of wonderment similar to a young child’s when he discovers and marvels at the world around him—very immediate, not lost in the future or in the past. This practice is just being with the moment and looking deeply, asking What is this? and being open to this as it happens to be. If you meditate in this way, your mind will become more flexible, and you will start to see that actually you have more choices in your actions and behavior than you thought possible. This seeing will allow you to respond creatively to thoughts by knowing what you are thinking and realizing when you come into contact with a new thought. Normally, a thought emerges so fast that you are not even aware of its arising. You just think it and act impulsively or habitually. When you meditate, sitting quietly, trying to focus on the question What is this? you start to notice what takes you away from your focus. Generally it is a thought of one kind or another. The meditation is intended not to stop you from thinking but to help you discover what and how you think. THERE are different practical ways to meditate with this method. The easiest way is to ask the question in combination with the breath. You breathe in, and as you breathe out, you ask, What is this? Master Kusan used to suggest asking the question by making it like a circle. You start with What is this? and as soon as you end one question you start another What is this? Another way is to just ask the question once and remain for a while with the sensation of questioning. As soon as it fades away, you ask it once more, staying with the pregnant sense of questioning until it dissipates again. You have to be very careful not to ask the question with too tight a mental focus. Usually it is recommended that you ask the question as if it were coming from the belly or even the toes. You need to bring the energy down and not tighten it like a knot in the mind. If the question makes you feel agitated, speculative, or confused, just come back to a simple and calming breath practice for a while before returning to the question. Keep in mind that you are not trying to force yourself to find an answer. You are giving yourself wholeheartedly to the act of questioning. The answer is in the questioning itself. It is like a child who has never seen snow. You tell him it is white and cold. He thinks it is like a piece of white paper in the fridge. You take him near a mountain and show him the top. He says that it looks like coconut ice cream. It is only when he touches the snow, feels it, plays with it, and tastes it that he really knows what snow is. It is the same with the question, and the tasting is in the questioning itself. Master Kusan was reputed to have had three awakenings—breakthroughs in understanding confirmed by his teacher—and still he continued to ask the question. A Western monk asked him why he continued questioning. After three awakenings, surely he must have found the answer. Master Kusan told him it did not work that way. As you meditated with this question, the practice developed in its own way and slowly evolved. So of course we asked him how he did the questioning at that point. He would not answer. He said that we had to find this out by ourselves. Any descriptions of his would give us misconceptions. GUIDED MEDITATION What is this? • Sit in a quiet and secluded place. Keep your back straight. Remain poised, at ease, and attentive. With your eyes half-closed, gently gaze in front of you. • With the first few breaths, connect the question to the out-breath. As you breathe out, ask, What is this? • You are not repeating the question like a mantra; you are cultivating a sensation of perplexity, asking unconditionally, What is this? • This is not an intellectual inquiry. You are not trying to solve this question with speculation or logic. • Do not keep the question in your head. Try to ask it from your belly. • With the whole of your being, you are asking, What is this? What is this? • The answer is not found in the Buddha, or in a thing, or in empty space, or a designation. • You are asking What is this? because you do not know. • If you become distracted, come back to the question again and again. • The question What is this? is an antidote to distracted thoughts. It is as sharp as a sword. Nothing can remain on the tip of its sharp blade. • By asking this question deeply you are opening yourself to the whole of your experience, with a deep sense of wonderment and awe. • When the session is finished, move your shoulder, back, and legs, and gently get up with a fresh and quiet awareness.